At Anchor our care homes and retirement housing schemes are very much part of their local community and really benefit from strong relationships with local schools. The testimonials below are from children, teachers and Anchor colleagues who have seen and experienced the positive impact mixing with different generations has on both young and older people alike. Mary Masterson, Headteacher at St Stephen’s Catholic Primary School: “We are fortunate to have as our neighbours, the residents of Woodville Grove. 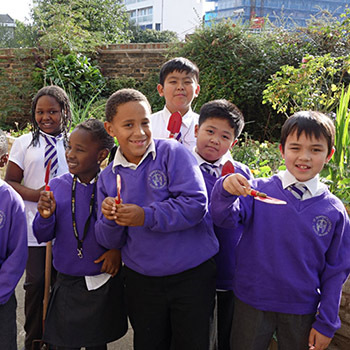 "We have enjoyed helping them in their garden and, hope they will help us in developing our raised beds, which are planned for in the school grounds. We also look forward to visiting soon to hear about their wartime experiences. Marilyn Barker, Manager at Woodville Grove retirement housing scheme: "It is very good to watch the children liaise with the residents, who have built up a good rapport with them. The residents love mixing with the younger generations and still have plenty to offer them. "Answering their strange and obtrusive questions and their inquisitive natures, you never know where the conversation is going and what subject you will end up discussing." Paul, Scheme Manager at Pembroke Court retirement housing scheme: "We have strong links with the local school, Werneth School, and over the last year they’ve made several visits for garden activities, Macmillan Coffee Morning and carol concerts. 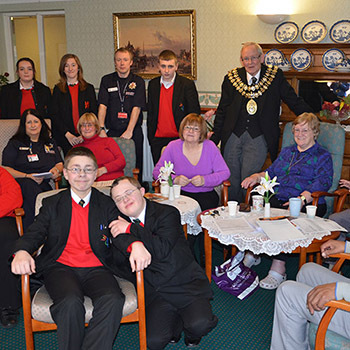 Children from Werneth School: "I like going because helping others makes me feel good." it cheers them up when we go." "It’s good they give us opportunities to come out of school and learn in a different way; Life Learning." "It makes me feel good talking to the residents as they never judge me and they always listen." "Love listening to stories of when they were at school! It makes me laugh." "It brightens my day and makes me feel good about myself knowing we are appreciated for what we do." 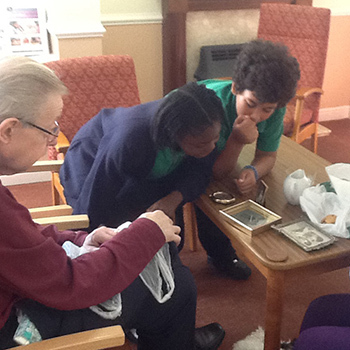 Ann, Scheme Manager at Fairfield Court retirement housing scheme: “We had a visit from a year five class as they were learning about the lives of older people. The tenants and the children really enjoyed speaking to each other. One of our customers made shells during the war and the children were fascinated by her stories. Julie, Scheme Manager at Barncroft retirement housing scheme: “It is really lovely to see the interaction of the tenants with the children - especially those who rarely see their families, or indeed, have no family. We are always invited to any events the nursery put on and it is an important relationship that we love to promote. If your school is interested in the Life Histories initiative and getting to know older people who live near by, you can use our Find a property tool to search for Anchor properties in your local area. Simply give your local Anchor retirement housing scheme or care home a call to find out more about arranging a visit. Был найден мной популярный веб портал со статьями про пластика носа.